Phillies pitcher Aaron Nola works in the fourth inning against the Boston Red Sox. 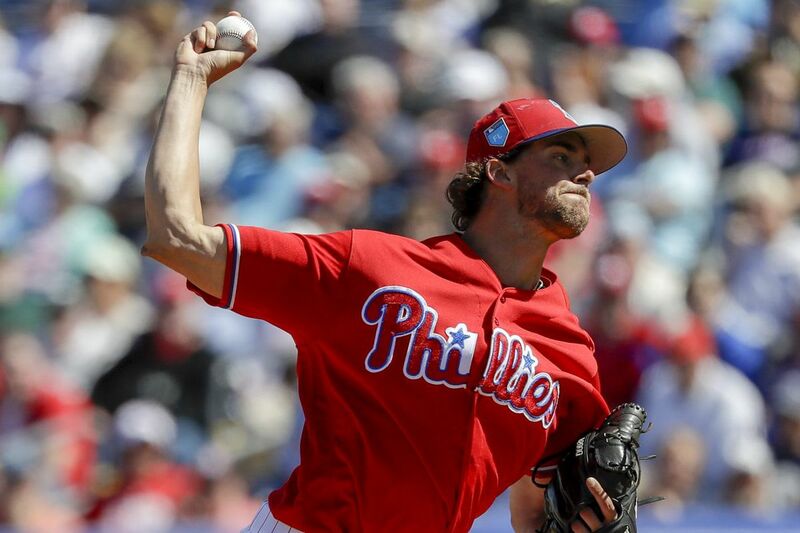 CLEARWATER, Fla. – Aaron Nola looked outstanding as he struck out five in four innings Wednesday, and the Phillies topped the Red Sox, 2-1, in Grapefruit League action. Nola was strong against a split-squad Boston lineup missing most of its regulars. Nola is the first Phillies pitcher this spring to exceed three innings, and it was easily the best pitching performance of camp. His change-up is still a work in progress, and Nola called it "subpar." But he did use the pitch to whiff Andrew Benintendi — one of Boston's two regulars — in the fourth inning. Nola began throwing the pitch last spring and threw it last season for 16 percent of his pitches. "As a starter, you need three pitches," Nola said. "You have to mix it up a good bit sometimes. If you don't have all your pitches working, you have to go to something else sometimes. That's definitely an important pitch." The Phillies used a lineup that could very well be the one they use on opening day. Manager Gabe Kapler played regulars at all positions with Nola, the opening-day starter, on the mound. The season will start March 29 in Atlanta. Drew Hutchison logged three innings and struck out four as he stayed in the race for the fifth-starter role. The righthander, who is in camp on a minor-league deal, allowed one run on two hits and no walks. The leaders in the fifth-starter competition appear to be Zach Eflin and Ben Lively. Odubel Herrera singled in the fourth inning for his first hit this spring. He had been hitless in his first 15 at-bats. Herrera was slowed earlier in camp by a sore shoulder. He played center field for the third time. Lively will start for the Phillies on Thursday when they travel to Tampa to face the Yankees at 1:05 p.m.